I have no photos from the Telegraph Avenue Holiday Street Fair. I know it’s a bummer, but my hubby left his camera/phone in the car and didn’t wish to fight his way through the hordes of Holiday shoppers to retrieve it. So no pics of colorfully attired attendees -moi- or booths. Not even those wild, chanting Hari Krishnas who regularly march down the Av in a state of joy. 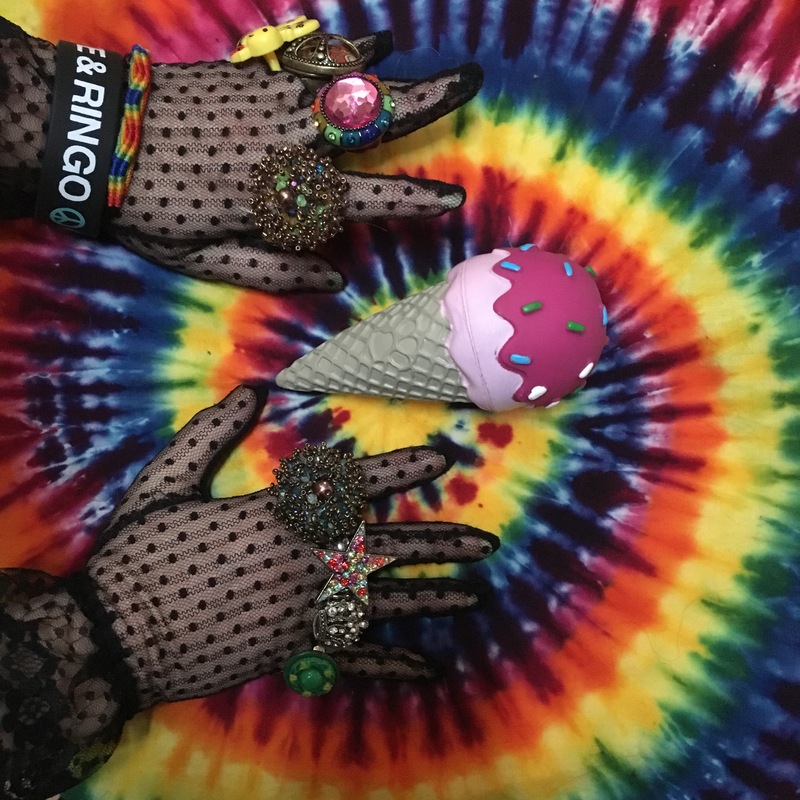 Too bad for Henry: A hippie vendor was so taken by my effort to be festive that he gifted me with a groovy button that reads “I’m not the black sheep- I’m the tie-dyed one.” And yes, “tie-dyed” was in vibrant tie-dye colors. Come on, could it be anything else? didn’t I go with the neighborhood gnarly gnomes who offered to do the search, you may ask? The gnomies wanted all the rum & brandy in my homie, that’s why!!! sheep -yes! – and lovely little lambs. They take part in the annual Children’s Nativity Pageant. ones it may be Christmas Eve, but it’s certainly not “Silent Night.” Waaaaa! FAB brownies with…you guessed it, a wee bit of booze. Ho, ho, ho… Ahoy, mateys! Our darlin’ doggie Rosie Colleen wanted the November LaughLaundry devoted solely to herself. give everyone a wee taste (ahem) of the utter joy she experiences during her fave celebration. Enjoy…Rosie Colleen says you bettah. And that’s all this Doggie Diva is going to say!! October was one rockin’ month. There was the 78th birthday of the late, great – I mean groovy- John Lennon. (How can that even BE??) I always treat myself to a wee British treat on this very important day for Beatlemaniacs. Yeah, yeah, yeah, I consider myself a charter member of John’s fan club. Wish he were here. I’d fancy hearing him tell all the people to just “Give Peace A Chance.” Right On. We can do it if we try, try, try. Right before John’s birthday we attended the annual “Indigenous People’s Day Pow-Wow” in Berkeley. It was canceled last year because of last October’s fires in the North Bay. There were many tribal people from the area and some major roads were inaccessible. But this year was bright, sunny and warm. It was a fine day for such a community gathering of Native folks. There were dancers, drummers and exquisite hand-made crafts to peruse. As I paused to view the jewelry creations at one particularly colorful booth, I asked the hubby what he thought about some cute barrettes. The man seated in the booth said he liked my earrings and where did I get them. The day after my beloved former Beatle’s birthday Henri and moi left for a leetle trip down to Southern California for an anniversary celebration. It was a l-o-o-o-ng drive, folks. We left mid-afternoon ( I wanted to leave in the morning ), which is so not advisable. Zee traffique is oh-so- heavy, mon. The freeway also isn’t as free as it once was either. Somebody decided to add toll lanes for workday commuters in a bit of a rush to get home/ go to work. And you need a well-paying job to afford the humongous toll charges. The trolls who control the tolls are working on installing them on my nearby freeway, too! What can ya do? I didn’t have any lunch because I planned on eating at a legendary split pea soup restaurant. It was dark when we arrived in their parking lot and I crawled to the front door- not! I had an all-you-can eat soup special. For travelers, it was. (I guess they realize hungry folks get stuck in bumper to bumper traffic these days…or into the evenings.) I slurped down four or five bowls of split pea soup; and I could have slurped more, but the manager said I had more than enough already. Yeesh. Even though I have some groovy photos of our trip I hope you will Google -puleeezze!- The Mission Inn Hotel & Spa in Riverside. This hotel is beyond magical. I’ve never seen anything like it before. Truly gorgeous, full of history, it is on the National Register of Historic Places. We got to Riverside at one in the morning and the streets were rolled up for the night. OK, so maybe not, but it was super quiet. We had a reservation for later in the afternoon, but we had to find a place to crash. I had thought that the Mission Inn was 55 miles north of Los Angeles, however, it was past L.A.! What a bummer. OK, so technically, I’m not a child, but don’t I deserve an Elf Tuck-in? I saw photos of, ahem, some of those “elves” and I want in. We left and drove to Seal Beach to visit & lunch -in Los Alamitos- with my warm & funny Laughter Yoga instructor who left San Fran to care for a parent. She now resides in his condo which she could never afford in S.F. She leads Laughter Yoga classes at the beach on weekends. HoHoHaHaHa. We also spent a couple of sunny days in beautiful Santa Barbara, often referred to as the California Riviera. There are palm trees everywhere, along with a drive-on municipal pier over looking the deep blue sea. We spent time there finally deciding to eat at a view café located over the ocean. Fab view we had. Also visited the Santa Barbara Mission (went to mass there) and had a wonderful time. I did not want to leave Santa Barbara. Surfers and sun lovers living in harmony, man. Over the San Marcos Pass (Google it) to arrive in Solvang. Yeah, it’s a Danish theme town, but we managed to find an Irish Pub to dine in and have a refreshing drink and then visited yet another Mission: Mission Santa Inez. So beautiful, sacred & worthwhile. 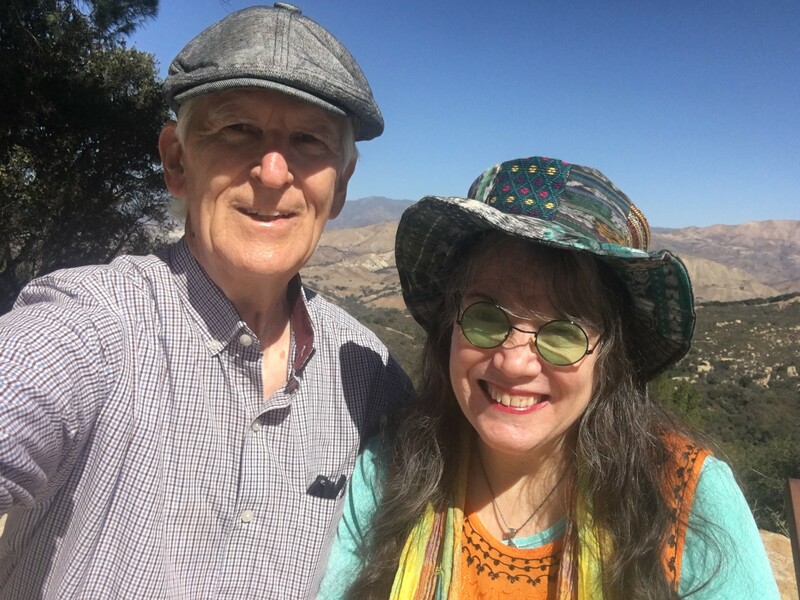 We headed home after a wee stop in Pismo Beach located half-way between L.L. & San Francisco. It was a short jam-packed excursion. We had a wonderful time but were glad to come home. And so was our doggie diva, Rosie Colleen, who was unhappy with her sit & stay vaycay. The week after we returned was also birthday time for Bender & moi. Mine is three days before his & I decided on Terrapin Crossroads in San Rafael. I was there for Mother’s Day, however, the places I would have liked to have dined at were closed on Tuesday!! I got a free birthday dessert, but no cake. Henry wanted to go to Carlos Santana’s Maria, Maria in Danville. ANOTHER free dessert -for both of us! Just what I needed -not! Well, Henri went way overboard when he went to buy a cake we both could share. The dude bought TWO cakes. We gave some to our neighbors but still had way too much cake to eat! NEVAH again. Next time I’ll apply it to my hips. OK, there won’t be a next time. I know I worked off some of it decorating for Halloween. And I did NOT eat a single piece of Halloween candy. The idea was just too scary, man. Hope you had a rockin’ October, too. (Last month my blog was so chockful of goodies that I had to omit an AMAZING photo of moi from my August post. The hubby and I were invited to dine with a totally groovy fellow in a town we aren’t all that familiar with. I chose the destination: The House of Prime Tofu. I used to love the tasty tofu steaks and cutlets made by the skilled tofu artisans at the defunct “Top Tip o’ the Tofu.” I was salivating at the prospect of dining on something similar at this new place. The weather in September was kind of craycray. We had a great deal of dry, hot temps and numerous “Spare the Air” days. With a heavy mixture of thick fog and smoke from Northern California wildfires blanketing the sky – and turning it a ghastly gray- I’m surprised we don’t have “Spear the Air” days. I believe they may portend the future, although I sincerely hope not. Have you been finding time for laughter? You know you need it. You know you want it. Have you been searching for joy and silly stuff? It’s everywhere, ya know. Pullleeeze tell me that you have tried to wear a few bright colors? My aunt tells me that her goal for the day is to put a smile on someone’s face. (You go, auntie!) My goal is to dress as colorfully (& a wee bit silly) as I can. Wacky glasses? Check. Wacky hat? Wacky socks? Double check. I spread peace and love & joy and laughter as much as I can. And I will often see people pass- me- by with a smile or grin on their faces. Feels pretty groovy, folks. Out and about in Oakland and Berkeley, we happen upon the most unusual sights. Because the Oakland Athletics baseball team was doing so well in September, wildly decorated statues of mice or elephants (I think I saw an elephant somewhere) were situated at places around town. Henri could not stop at one spot for a photo as he feared for his life. NOT from A’s fans…craycray drivers, dude. He did risk his bod running across a Berkeley street sometime later after snapping a photo of a new sign planted opposite an Irish pub. The stop sign featured an outline of a musician holding a guitar running ‘cross the street! See the photo, OK? It will explain all. 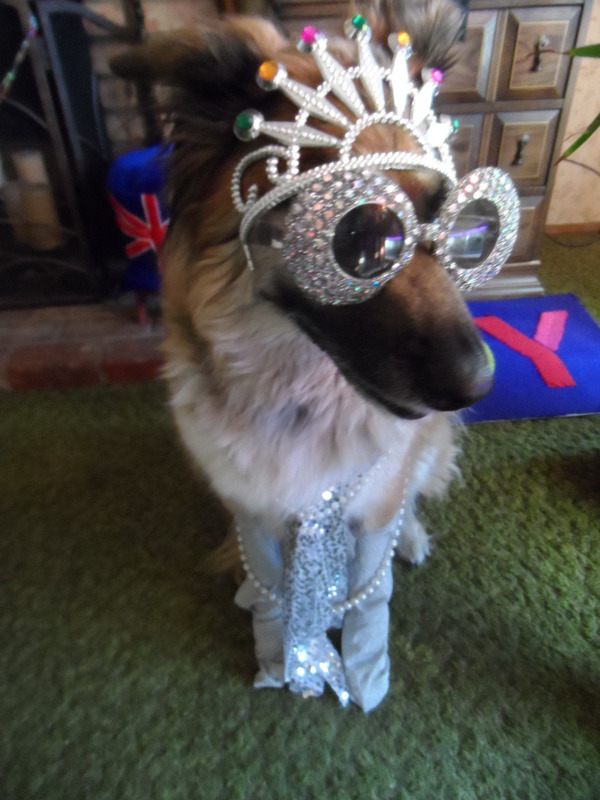 Our doggy diva, Rosie Colleen, did attend Barkchella in September. It is a barkfest that is likely to become an annual event. Rosie used to be pretty much the only hound in the hood. But now she has so many canines to commingle with. There’s Lexie behind us (with a brother who does not participate -yet! ), there’s Precious and Gunny on one side who could compete with the best of the rest, and a recent neighbor whose name is unknown, but is a champion yapper. These all- pro barkers are eager to enter the annual “Bay to Barkers” (fur real). We are all living in a canine cacophony. I’m praying we nevah have a CAThophony. Now that would be rrrruuufff. Happy Fall, Y’all. You realize I was just “ribbing” you, right?? There is also a photo of my peace sign loving neighbor, Judy & my groovy living room table for your enjoyment. Remember to always look on the laugh side of life Even though it’s not all that easy, is it? The month of August officially begins with Jerry Garcia’s birthday on the 1st. Henri was dispatched to the local grocery store to purchase some Cherry Garcia ice cream. Yummy stuff it is filled with chocolate chunks and delish pieces of cherry. I thought the ice cream tasted a wee bit off which was a bit of a bummer. More like a major bummer, man. Something was off and next day I removed the carton from the freezer only to discover my old man’s mistake: he bought non-dairy, man. He somehow thought it was the real deal. Jerry would have been shocked, I say. Shocked! 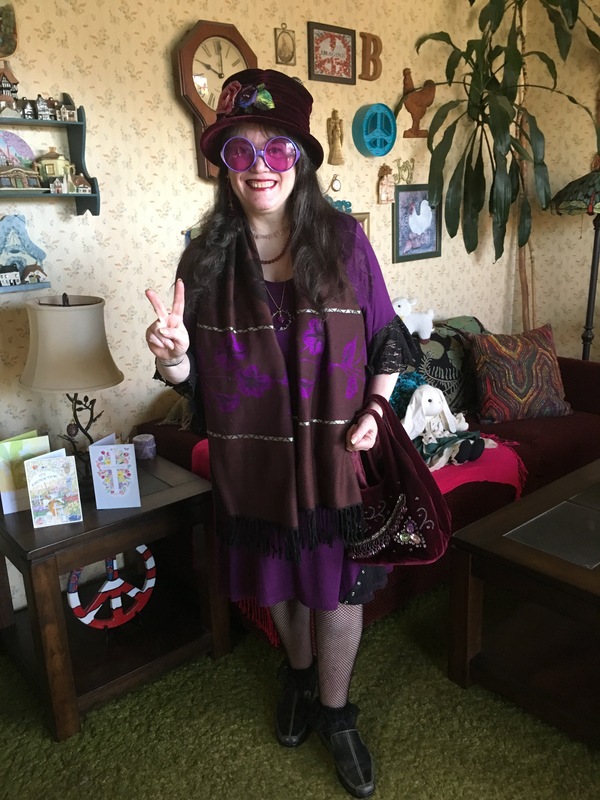 I planned my outfit for the Deadhead event of the year, the gala of glam, the magical musical marathon worth the price of admission…wait, there is no admission to pay! That’s why it keeps growing more popular each year. I don’t know where all the grateful attendees come from (I think some may camp or hide in the forest all year, lying in waiting to grab their spot to crash for the show). Who knows? I do know that our tie-dyed friends who we could not seem to locate at the Haight/Ashbury Street Fair were a no show as far as I could tell. I keep upping my festive attire game and it’s getting more expensive each year. But I must give the Deadheads what they expect. Dontcha think? I’m already putting together another creative ensemble for next year. I gotta stay groovy. Many folks asked the old man and moi how long we have been attending Jerry Day. We have been there for all but the first year. It wasn’t that crowded our first visit to the Jerry Garcia Amphitheatre. In fact, it was just the Amphitheatre in McLaren Park way uuuupppp there in the San Francisco hills. Parking wasn’t even a problem then. Yeah, right. But the modest crowd size guaranteed every attendee a decent slice of birthday cake. With frosting. Yum. Those were the days my friends, we knew they had to end- the very next year, bummer. However, we have become rather famous, primarily for the old man’s terrapin topper which still causes quite a stir/stare. Our annual Christmas card photo/seat saver friends were also no shows again this year. Perhaps they went to another music show which are several in number in August. Miss you guys. But surprise, surprise: Annie was at Jerry Day! With her long red locks, she must be living in the Bay Area somewhere. She loved the earrings I was wearing. (she makes fab earrings, herself.) She was seated waaay up the hill. I don’t do hills. There were lots of colorful people in attendance. And they kept arriving over the four or more hours of the event. Cindy from Sacamenna was there rockin’ the place, along with the amazing dancer Primo and his colorful wife at the Haight Fair featured in my June post. Actualy, the whole forest was rocking, even the pooches along with their people. Henri recorded a video of longtime rockers at the event performing a Dead tune I confess to not knowing the name. Gasp! The Grateful Dead have a huge library of music. Some of it goes back to before I was a fan. Maybe, you know the name. If so, pulleeeze let me know ASAP. OK? After that unknown lengthy tune, I heard my absolute fave song which is “Shakedown Street.” I heard it at a Dead concert and it became my fave. That’s how the magic happens, I guess. Plenty of magic was on hand at the 2018 Jerry Day concert as well. People were so jazzed they didn’t want the music to end. Heck, I didn’t want it to end either. And the magic of that day will live on. (As will the sunburn, bug bites, and achy muscles, man.) But the admission price was a real bargain even if they do seem to move the J. G. Amphitheatre further away from the parking lot every year. They can’t really do that, can they? Perhaps some truly gifted and Deadicated fans who want less folks to find the place have found a way?? Now that WOULD be magic, man. Folks if you want to become a member of the privileged few thousands next year plan on arriving early. Early enough so you don’t have to climb a tree. You don’t want to hang out on a limb, do you? I suggest you should go camp in the woods until next August! After seeing this year’s gathering, now is not too early at all. The winter is very mild in San Francisco. Yeah, right. Other stuff happens in August, but we won’t go there. Just let me say that all of August is Tie-Dyed. Hope your August was tie-dyed, too. July was all about celebrations, leading off with the birth of the USA. There is WAY too much noise in the celebratory mix, man. It’s only ONE day for fireworks (where legal): not a week or so before and a week or so after. The hounds in my hood have asked folks to refrain from this annoying and frightening practice …PULEEEZE. My poor pooch “Rosie Colleen” is begging (no, not for dog treats, she howls for them). The Dalai Lama was next with a birthday to celebrate, OM my. Following him on the birthday agenda was the big 78 for Sir Ringo Starr. And for that I say OMG! How can he have reached that age so soon? This newly -minted Knight looks totally fab, man. The only gift that Sir Ringo requests is that everyone (that means YOU!) get their bod to the door or wherever, and at noon (anywhere in the world) shout Peace and love! Peace and Love! I know, along with Sir Ringo, that YOU can do it. Throw on a little tie-dye, make that peace sign, and do something that the whole world will thank you for doing. Because Ringo’s b-day was on a Saturday this year, I knew there would be neighbors out and about. But I was SO ready for them. I had me Ringo tee, bracelet and Union Jack sunglasses on to complete the Royal look, I did. It was no problem at all for moi as I’ve got er down dude/dudette. I exited my front door exactly at noon Pacific Time. Showtime! Ringo was off in Europe doing concert work, so I guess he didn’t hear me, huh? I then repeated Peace and Love (twice) at my backyard sliding door in case A neighbor or two missed the urgent plea. Only a couple of hounds howled, however. July had a humongous surprise for me: Who knew it was the 50th anniversary of the film release of the Beatles in “Yellow Submarine?” I may be a major Beatles aficionado…. You bet I am! – yet I never saw this fab flick until the Big 50th anniversary. It played all over the country for a special, special engagement. Henri and moi decided to go to a classic movie theatre in the city of El Cerrito. El Cerrito is a groovy little burb where we used to grocery shop at a local natural food store where all the produce is organic only. They have a fab new annex with lots of yummy prepared foods for purchase. The hubby and I stopped there for lunch before we went to see the movie. The staff at the theatre were all helpful and friendly. So were the patrons who said we won first prize for our attire. I even had a tee-shirt for “Yellow Submarine” on. We weren’t at the evening singalong showing, but you know that I was gonna sing right along with the Beatle tunes, don’t ya? How could I hear those groovy tunes and not sing? Come on. Oh, and the word “groovy” was used prominently throughout the film. How groovy is that? As we walked back to the car (Mini Cooper, baby!) we noticed a classic British Triumph parked in front of us. Far-out! That is until we turned around and drove past the car whose other side had yet to remodeled. In need of a serious paint job, mate. We had a fab, groovy day in lovely El Cerrito. Cheerio. June was like soooo groovy, man. The old man and I put in our annual appearance at the Haight/Ashbury Street Fair in (still) beautiful San Francisco. (I say still beautiful despite all the intrusive building cranes that resemble – at least to moi – an alien takeover. I refuse to pay homage to new buildings that look as though they were designed by architects from the planet Mars.) 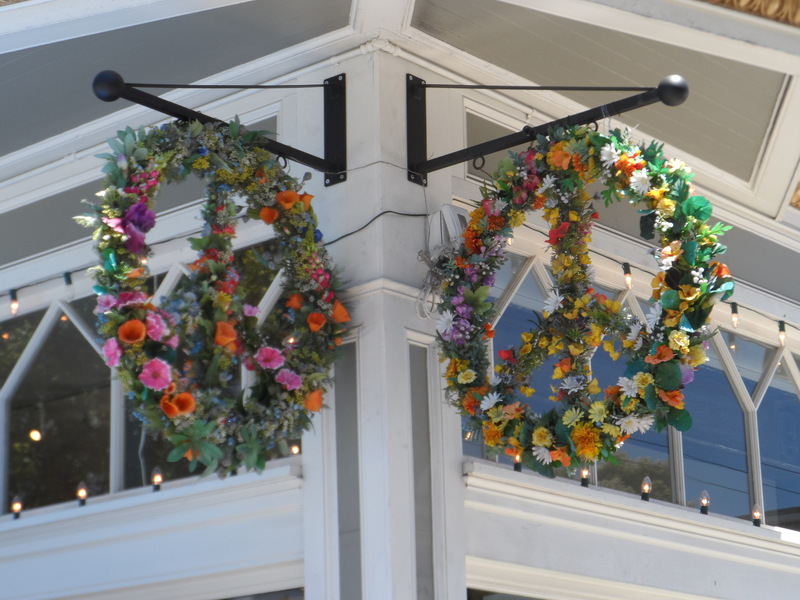 It was a “beautiful day in the neighborhood” known as Haight/Ashbury (thanks, Mr. Rogers!). The 19h Century Victorians held an appeal to the early hippies who were attracted by their style and inexpensive rents. There is still an assortment of genuine hippies populating this now unbelievably expensive area of San Francisco. I like to believe that my hubby and I were among the beautiful folks who visited the 2018 Fair. We always dress the part and up our game each year. (Well, I do!) 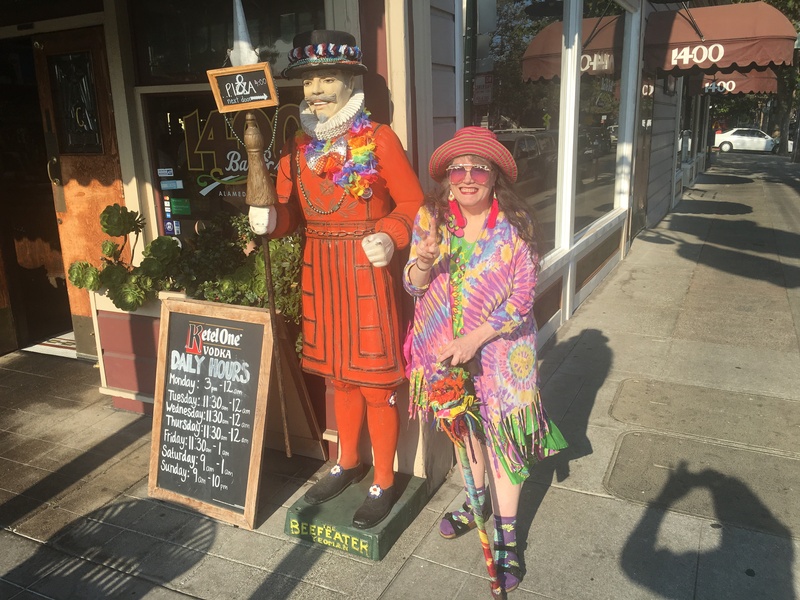 The wonderful woman (who probably needs a podiatrist after all the hours she spends on her feet) who generously works the booth for the Haight/Ashbury Food Bank said she “upped her game” because of Henry and moi. 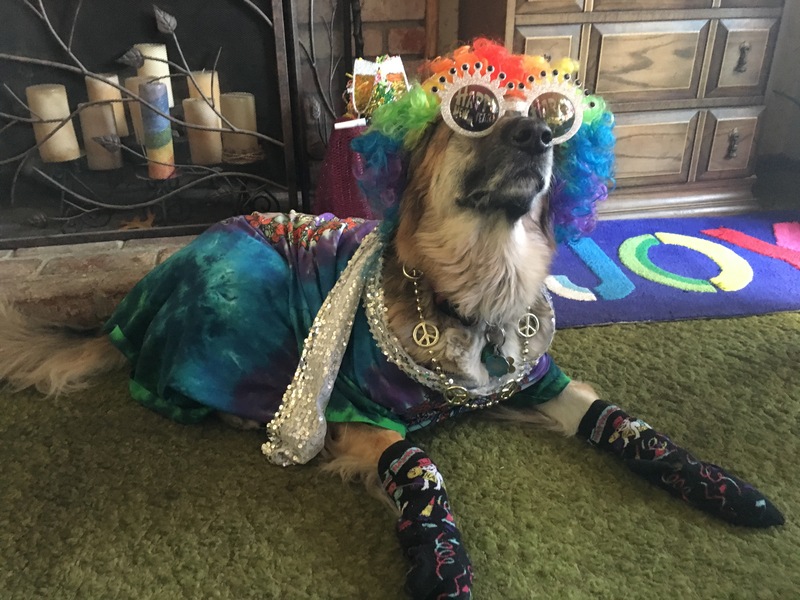 She rocked in total hippie attire. She told us we missed our “hippie friends” -aka Wayne & Estelle- who stopped by at least 30 minutes before we did. For some reason we missed seeing them the rest of the day, too. (The Fairgoers were denied the pleasure of viewing our annual tie-dye tsunami.) And we “missed” seeing them at last year’s Jerry Day as well. A real bummer. The throngs of visitors could not miss us passing by: Like we were aglow in total tie-dye. Cameras were popping everywhere we walked. As the day progressed we met fun folks visiting from France, Scotland, Ireland, New Zealand, Germany & China. Heck, we even met some people visiting from a far-flung country called Canada. The World seems to know about the hippie Haight. 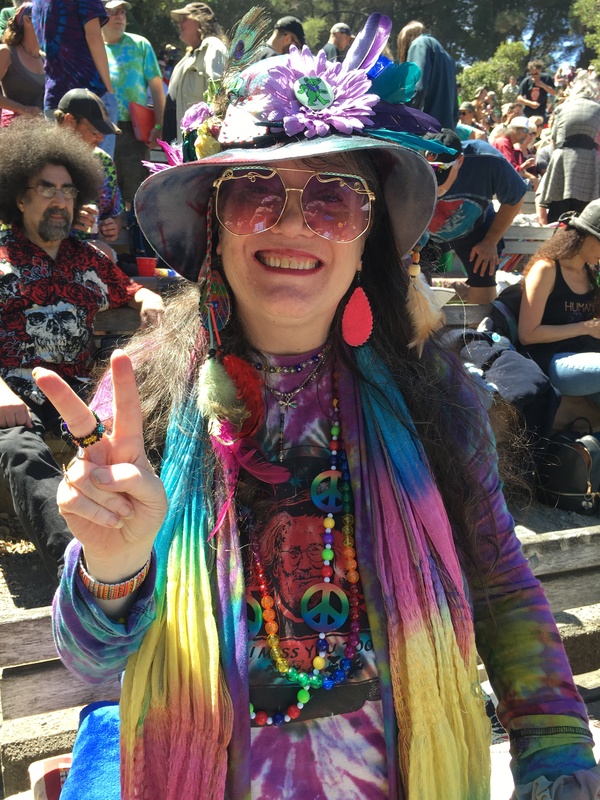 A mother and daughter from Dublin, Ireland, dressed in fashionable hippie garb, traveled to San Francisco because of their desire to be at the Fair. While chatting, the daughter revealed she worked at the Guinness Storehouse in Dublin. (Hello, I visited there on my trip overseas with my sister. Got a wee bit tipsy, I did. The national brewski is supposedly stronger when it’s brewed in Dublin. Slainte! I must return for a pint…or two.) Here’s hoping they enjoyed their holiday in the City. We missed seeing some folks we really hoped would be there, however. An awesome couple who create equally awesome tie-dye paraphernalia were no shows. So were a glamorous hippie couple from Hawaii who create custom crafted flower headbands, and an assortment of groovy hippie goods. 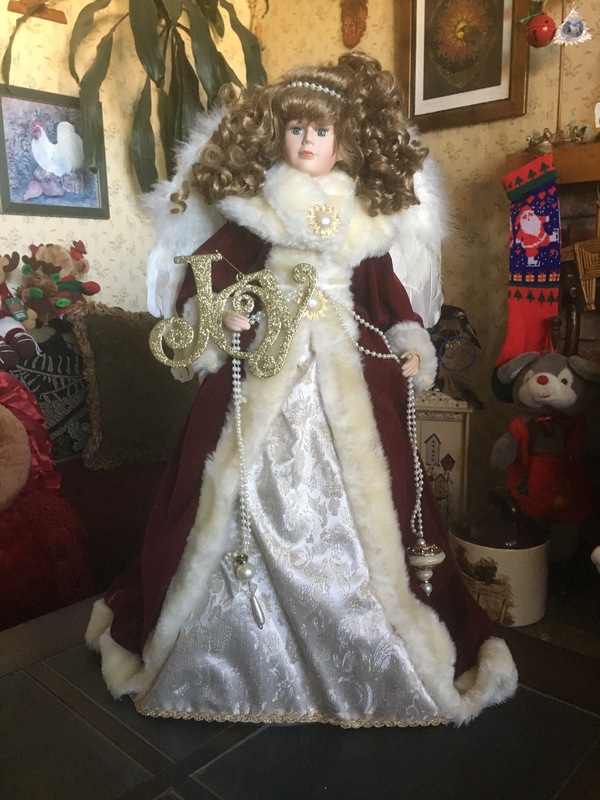 We did see (see photos) this glam couple’s equally glam cousin & companion who were strolling Haight Street laden with family craft from Hawaii. Very friendly folks. The unique artist Annie was also missing. She may have left the Bay Area. Hope we see you again. There was a surprise for us, however. We spotted Deadheads we knew! The husband is famous at Jerry Day for his groovy dance moves (he danced at the Haight St. Fair- far out!) and is often featured on the local evening news after the event. This couple looks SO good and always make the effort to be festive. Thank you, kids. See you at Jerry Day!! I had some phon-ay beef sautéed with veggies nestled in a bun (yum! ), while the old man had some non-fake sausage & onions on a rock ‘n’ roll. OK, it was just a white bread roll. Ya gotta eat, man. I drank green tea and water while I drank in the colorful scene. More folks – mainly Deadheads in Grateful Dead gear- were dressed to impress than in the past. Not certain, but I’m pretty sure (you can believe me!) that I witnessed Beatle George Harrison, Jerry Garcia, Jimi Hendrix and Janis Joplin emerge from their respective wall murals lining Haight Street. Maybe I drank some weird water. Or perhaps a psychedelic effect from too much hot sun? Dunno. But, far out, man. We had fun, we put smiles on many faces, gifted them with healing endorphins (you’re welcome), and activated some of our own. That’s likely ‘cause I petted a lot of hippie hounds along the street. Looking forward to next year, man. Father’s Day brought us to the city of Lafayette for some dang good ol’ Texas-style barbeque. Son was not happy they ran out of lip-smacking Ribs. Oh well. Hubby was happy, though. And Henry heard from second son in upstate New York. This son did his own N.Y. style barbequing and he had a good day, dawg. You know who British singer, comedian and all round badass James Corden is? Well, he’s a multitalented star on late, late night TV. Well, James went off to do his shows from London, and the hubby and moi are quite the fans. We record his program weekly. Henry saw a blurb regarding his final show from jolly old England on a morning news program. Oh, yeah, yeah, yeah. Watched it that evening (it was like medicine for a weary soul), and laughed, cried, and had an experience of utter joy! What was I watching you ask? Well, it was no other than the legendary Beatle Sir Paul McCartney, it was! James Paul McCartney and the very excited James Corden drove to all the historic Beatle hotspots in Liverpool while warbling fab, gear tunes from the Beatles songbook. It was a sight to behold as fans realized that Sir Paul was in their midst. An unexpected stop at a local pub brought fans to their feet, as well as frantic fans flocking in droves as they heard Paul playing LIVE with his current band. It was more than enough to excite any Beatlemaniac, including yours truly. I’m providing you with a link to view it for yourself if you haven’t already. Sir Paul celebrated his 76th birthday on June 18th. Yeah, yeah, yeah, yeah! June was like SOOO groovy, man. Love was in the air (hello, aromatherapy) during the Merry Month of May. May was all about celebrations of love. May began for moi with a groovy celebratory meal and cocktail drink (Irish whiskey, brut champagne, fresh berries & lemon syrup equals Yowza!). There was also some fab live rock music after the feast. Where was I? Well, I had to be at Terrapin Crossroads in the magical Marin County town of San Rafael. That’s the spectacular hotspot owned by the Grateful Dead’s Phil Lesh. You knew that. The place was packed, indoors and out, with scores of Deadheads and folks in search of a good, affordable time. Outdoors there had been an earlier brunch (I’m not a fan of big, early meals & unlimited champagne- really), and a lunch hours Margaritaville at the Beach extravaganza. Did not know that Phil would be playing outdoors. Bummer, I missed seeing him this trip across the Bay. My outer East Bay son accompanied Mom & Dad, and I ended my dinner with an extra, extra rich French chocolate dessert. Magnifique, man. I also heard from my younger son who resides in upstate, upstate, upstate New York. Unlike most of the country, Mom Nature said “alright!” for a change. When vivid sunshine happens it adds glorious glam to a special celebration. I believe it does, so there! Traffic & parking was such a breeze, I must have been dreaming. And this year I didn’t get blown across Phil’s parking lot. So yeah, it was a dream. Something that wasn’t a dream, but which I always find dreamy was the annual Himalayan Fair at Live Oak Park in North Berkeley. And it is always a celebration of love: a celebration of Himalayan cultures, food (ah, the FOOD), dancing, singing, chanting, spiritual traditions, etc. And most of all, the colorful people who attend, perform and sell their wares at gloriously festive booths make it my fave event of the social season. But don’t tell the fun folks who run the Haight/Ashbury Street Fair, OK? It’s our little secret. The festive attire at this particular- fair puts Haight/Ashbury to shame. Even toddlers make the effort. Ditto for dogs. Well behaved pooches are everywhere, man. And a tiny tot chased me after seeing my pink “flower” bag. He thought it was the real deal. Henri and moi posed for many photos, and I received numerous compliments. People remember the two of us from past fairs -even the Haight-Street & Jerry Day as well. Ya gotta give the peeps what they expect to see. OM my gosh. The love and joy are palpable at this cherished event. Funds are raised to help the needy in the Himalayas and local organizations. Henry recorded two videos that I hope you will enjoy. Perhaps they will do what I love to do: put a smile on yer face. It makes me and the one “gifted” feel happy. That is my heartfelt wish. The reason for my attendance on Saturday at this two- day fair is the full-blown (literally) healing performance of Karma Moffett. To say that what this man does with Tibetan bowls, bells, conch shells & a long horn is magical is just not enough. Like, what this blissful man does is ethereal. The whole of Berkeley receives a healing, young grasshoppers. It’s totally awesome and you will tingle with joy for days. I thank you, Karma. As we were leaving we briefly chatted with a woman who had traveled from Florida to attend the event. She waved at us saying “Namaste,” a spiritual Himalayan goodbye. “Namas Go” muttered my hubby. (It’s a humorous adlib from cosmic comedian “Swami Beyondananda,” who enjoys saying, Namas Stay & Namas Go!) It was time for us to go! The Himalayan Fair also happened to be on the day that Prince Harry of England married former actress Meghan Markle of California. I had to go to bed awfully early to be assured of a good parking spot for the Himalayan Fair (I got it! ), so there was no way I would be able to watch the joyous occasion which was televised beginning at 2 in the morning West Coast time. Whew. I had my home decorated for the big day, however. 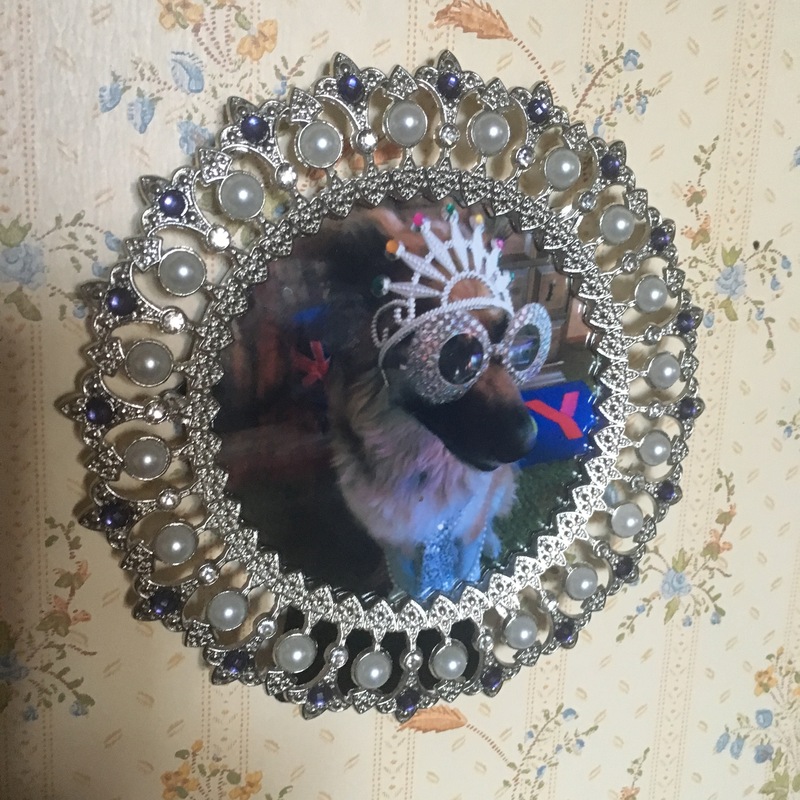 The mantle, you know, screamed Royal Wedding. After I dressed in my classy Fair attire (I could have tweaked it to wear to the Royal Wedding if Harry & Meghan had only invited me. Cheeky, they were. ), I put my robe back on and sat down to a cuppa tea and some current scones with my fave blackcurrant jam & imported English Clotted Cream. It was the least I could do for this delayed celebration of love. Classic Potato Leek Soup -imported, imported English cheeses, including Royal Edition Cheddar from Somerset, I believe. The main entrée was a Shepherd’s Pie (frozen, duh) with a sweet potato topping. I added some imported Branston’s Pickle for a more authentic touch. No time to purchase the dessert I wished for, so I gleefully ate a Cadbury Flake bar. The English & Irish love this yummy chocolate treat. Next day we had sliced Lemon crème cake with dinner. Short on time to get the ingredients for a proper shandy, so I had me a Guinness. Meghan, er, I mean, The Duchess of Sussex, is a fan of Ireland’s tasty brew. The meal was quite delish. Oh, and I was up way-too late until 2 in the morning catching up. The Royal Wedding was awesome. It was an amazingly beautiful celebration of love that brought so much happiness and joy to a world in need of it. Love and best wishes to Harry and Meghan. May was all about celebrations of love. 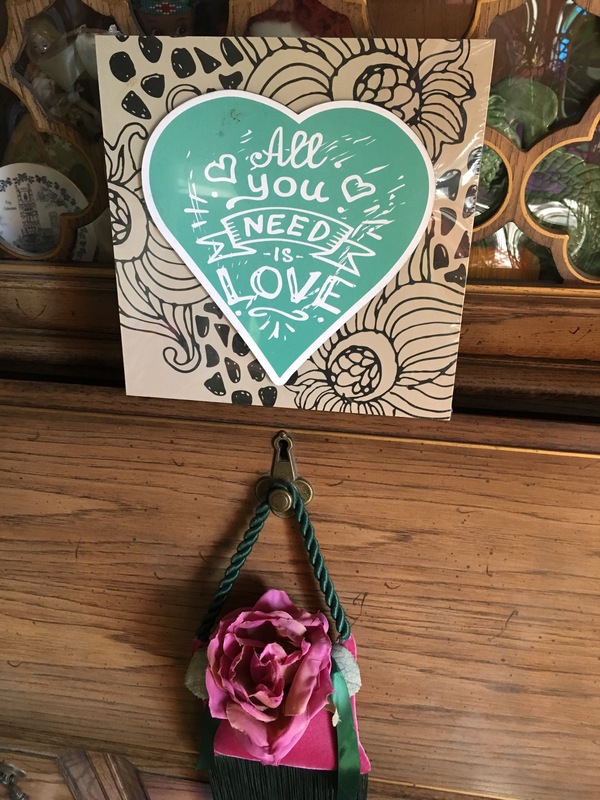 Like the Beatles sang long ago, “All You Need Is Love, Love is All You Need.” Yeah, yeah, yeah. You likely have noticed that TheLaughLaundry has been on hiatus for the past several months. At least I hope you have. You may have wondered waaaazz-up with that? I hope, I hope, I hope that you missed my monthly take on the humorous/joyful events that take place in the life of a FUNcilitator. Wait, a WHAT?? You’ll figure it out, right? If you have wondered where I’ve been, folks, I’ve been living in “Cloud Cuckoo Land.” (Some might believe we currently reside in a version of CLOWN Cuckoo Land. You decide.) I don’t even know what this means. While I was watching a British home-search program on TV (telly), the real estate agent used this term to describe the unrealistic expectations of an American who wished to purchase a home in a trendy (READ EXPENSIVE) area of London. At a bargain price, of course. I took a bit of a fancy to the expression, for some unknown reason. Perhaps I just fancied his posh English accent. Who knows? I became trapped in C Cuck L because of my inability to keep up with the demands of the serial -NOT cereal! – decorating of my fireplace mantle. I know I said the holiday mantle photos would come to an end, but did I say WHEN? The fact is, the mantle demands to be decorated, folks. And there were just too many holidays/festive occasions going down in Feb/Mar/Apr. Aye, aye, aye, I tried. I really did. I just could not decorate/undecorate fast enough! The St. Valentine décor fought it ought with the Chinese Year of The Dawg (Dog?) over the mantle space. And puleeeze don’t get me started with the St. Patrick’s elves, gnomes & leprechauns. NOBODY was chasing those wee folk away. Like the carnival cast from Mardi Gras who wanted to stick around for as long as they possibly could. I’m still finding rabbit fur left behind by the Easter Sunday Crew. Dagnabbit…or is that rabbit? (Maybe my Doggie Diva Rosie “plucked” some of her excess fur for a canine decorating scheme? Dunno.) Who would really know with this past Easter Sunday occurring on the annual feast of the patron saint of silly: St. Stupid. Or, as most people call it: April Fool’s Day. Numerous festive photos from the hubby include the famous Lakeshore Ave. house where the residents go WAY over the top with their Easter Bunnies, honey. I ate ONE leeetle cupcake. Okay, George? 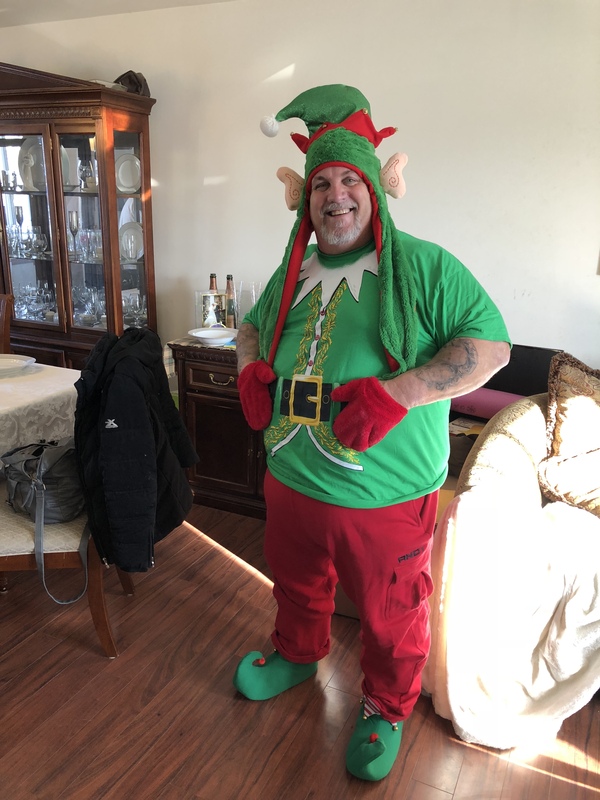 OK, so I can’t put the blame on Santa’s elves, BUT I can put the blame on an “elf” I thought I knew: me bro Billy Danny: I don’t know what possessed him to go total elf on Christmas Day. Billy Danny informed me that his Christmas ensemble magically came together; the elf suit, the funky hat and the craaaazy shoes that were gifted to him. He was truly a holiday gift: He brought smiles and laughter to everyone who saw him that day. Look at his photo. Believe me, he wasn’t hard to miss. Those elf shoes made him merry. So why am I blaming my bro for not doing my BLOG post? I could not stop laughing!! Every time I thought of him gone green I created spasms of uncontrollable laughter. With all of the feel good endorphins from nonstop laughter, I just wanted to lie there, chill, and eat chocolate bon bons nonstop. However, I applied a few extras directly to my hips! Both of our Christmas shopping treks to the annual Berkeley’s Telegraph Avenue Fair happened in ideal weather. I even wore too much clothing the second trip. Guys roamed in shorts and flip flops, dude. (Probably Cal students, though.) It’s great fun to see crafts people we love to buy from show up for the holiday shopping season. Sharon, Linda, Sandy, we love you all. And per usual, folks stopped Henri and moi to take our photo. People got excited to see us. WE brought smiles to many faces. Just hope we didn’t bring on any uncontrollable laughter like my bro did to me. I don’t want a chocolate shortage, man. Give us peace-loving neighbors a break…puleeeze.